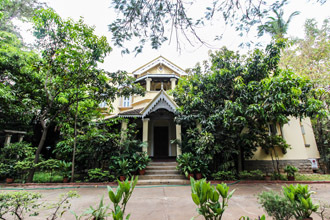 This heritage villa is located at the residential locality of Malleswaram, which has an ancient pastoral charm to its interior designs. It houses eight furnished rooms, and also boasts a small meeting room that can accommodate 15 guests. There is also a restaurant that serves a mix of Indian and Continental cuisine along with the local delicacies. Guests can take a dip in the swimming pool or take a stroll in the green gardens and enjoy its peaceful ambiance.